But let's start that story from the very beginning. 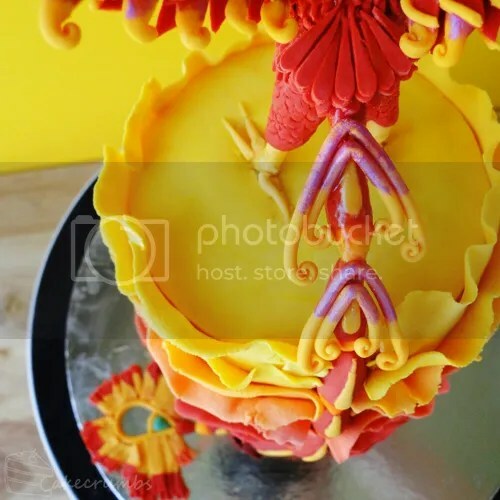 The biggest challenge with this cake was how to make a bird topper. 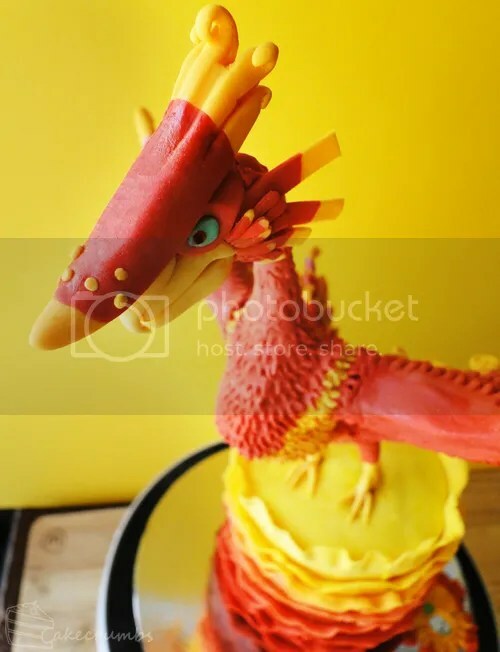 I do everything to avoid putting inedible components into a cake, but since this one was for an art project I decided to cross over with techniques used for clay modelling. 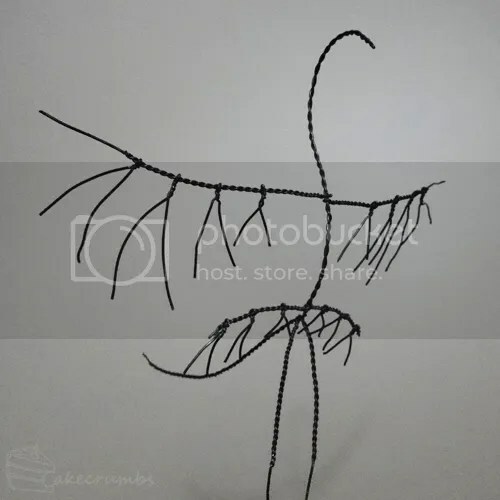 So I made a wire frame to give the structure support. 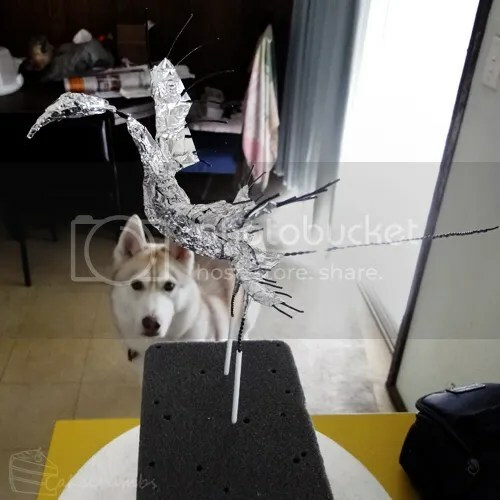 In an attempt to reduce the amount of weight in the topper (it is seriously top-heavy), I bulked it up with some aluminium foil wyhile my puppy tried to work out if this meant he was going to get to eat something. I left the topper and began on the cake. I had grand plans of incorporating the design of the temple, the Ancient Cistern, into the cake. 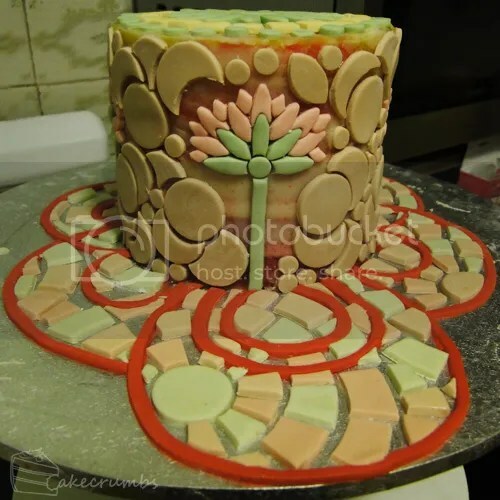 The temple has gorgeous tiled walls and floors, so I decided to try a mosaic technique with fondant. 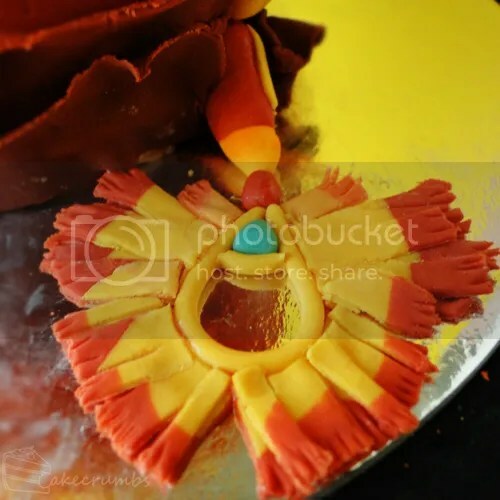 The idea was that you cut the tiles out of fondant, then use royal icing as the mortar. I spent 8 hours making the fondant tiles to resemble the cistern. But when I tried the royal icing it all went to hell. It was unsalvagable. 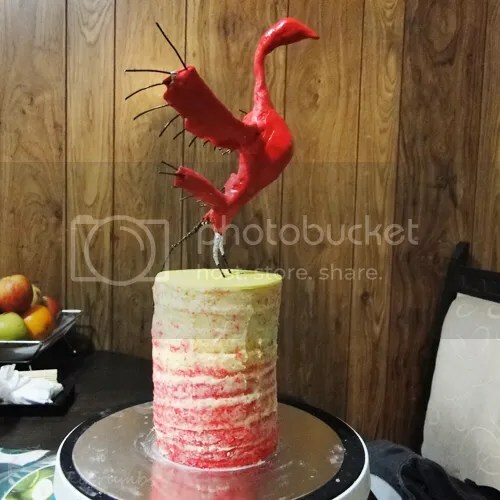 The worst, and weirdest part, was that the cake itself also started leaking a red syrupy-like liquid. I have no idea what was going on there. That's what I get for trying a new recipe instead of sticking with tried and true. I binned that cake and postponed the project. I had urgent deadlines at Uni and couldn't afford to put them off for cake adventures any more. Two weeks later, I found the courage to return to the project. I rebaked the cake with my usual buttercake recipe. 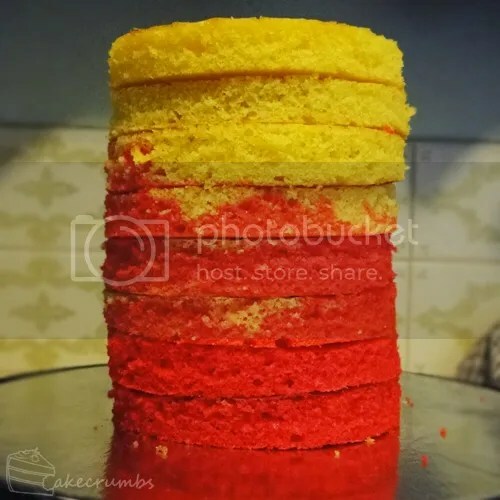 The colour, though not easy to see here thanks to my yellowy kitchen light, gradually progresses from red to yellow. 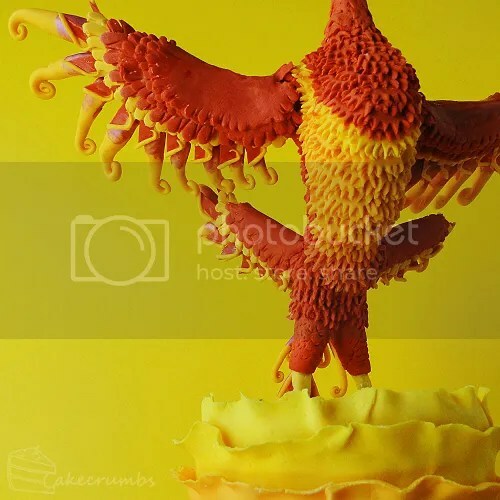 I used an orange flavoured buttercream and began working on the bird again. At the point, the wire frame snapped. The legs snapped off. The torso broke in half. The fondant wouldn't adhere to the foil. I nearly decided to throw in the whole project right then and there. I persisted. I repaired the frame as best I could and shoved it into the cake. Throughout the whole process, I've continued to have problems with it, but I'll spare you the whiney drama. Lesson is that next time I need to use a thicker gauge wire. And a denser cake to stop the weight of the topper from tearing through it. I finally got a rough covering of fondant. Time to take a breather and return to it tomorrow. The next day I began to work on the feathers. I severely underestimate how long this would take me. I thought I'd be done in a day. This took me a week of long days and long work. This cake certainly tested every ounce of my patience. But in doing so, I learned some valuable lessons along the way. 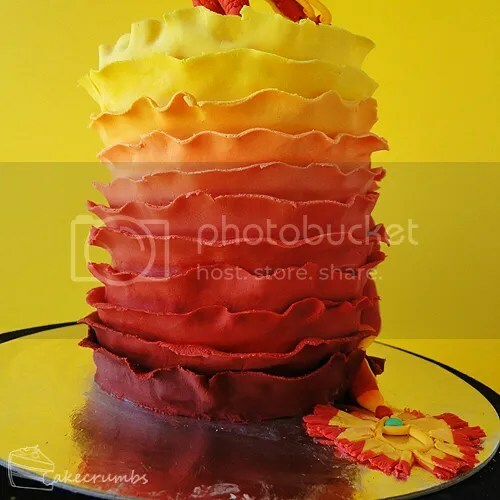 There was no way I was revisiting the tile idea just yet, so instead I wrapped the cake in ruffles to match the internal colours. I figured it was sort of fire-like anyway and fitted the theme. Finally, I finished this overly ambitious adventure. There are a lot of things I would have liked to have done better, but by the end I just wanted the ordeal to be over, so things became "good enough". I hate doing just good enough, but I lost my ability to care. 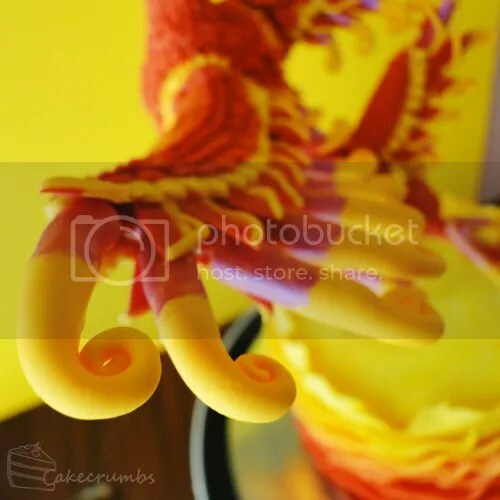 I spent so long on the details I am going to indulge in a little photo spammage of the cake topper. My favourite view is admittedly from the back. It's here you get to see most of the detail. The wings took me around 15 hours to complete. Perhaps more. I lost my concept of time. The difficult aspect of the wings, aside from the intricacy of the feathers, as that here more than anywhere else has a lot of two-tone parts. That made it a massive challenge. I got out of it with the curled yellow feathers by painting the purple on with lustre dust. However, the purple was the only colour I felt this could work aesthetically. 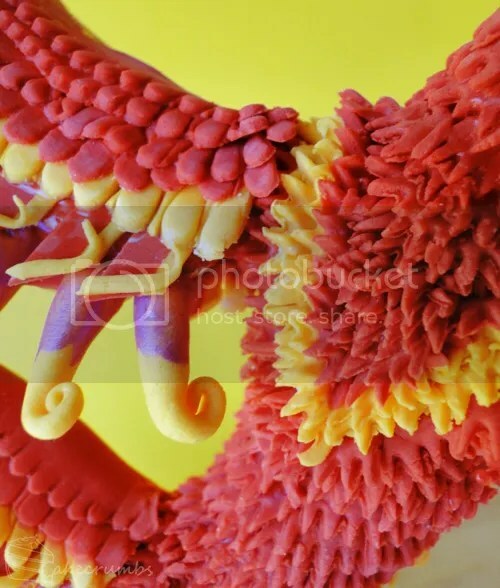 For the red and yellow feathers, I piped strands of fondant and rolled them together to get the two toned feathers. That sad part is, these became mostly obscured by the yellow swirls and the other feathers. But if you look closely you can see it. I couldn't get away with doing just one side of the wing, so I had to do the underside as well. 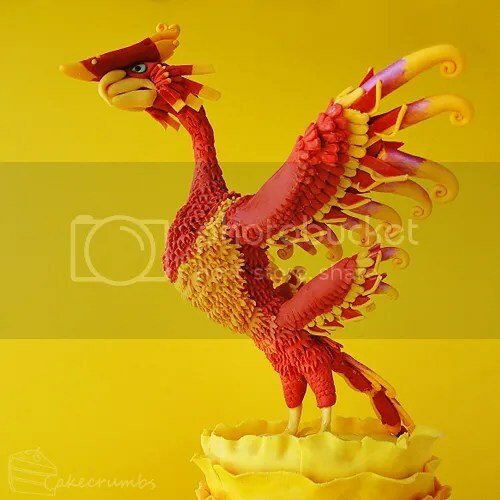 This involved lots of kneeling on the floor just so I could see under the bird, and dropping tiny bits of fondant in my face as I tried to attach them. I'm so unco. All of the feathers over the entire bird were individually cut and placed. It took so long, but I think the detail it gives is worth it. Then there is the Furnix's gorgeous tail. The tail is both a prominent part of the design of the bird, as well as important for battling the bird in the game. As it appraoches you, it's tail is curled tightly up while it spits fireballs at you. If you hold it's attention for long enough, it's agression will escalate and it will unwrap its tail and prepare to strike you. It's in that moment that Link has to use his whip to latch onto the tail and yank the Furnix to the ground where he can battle it. 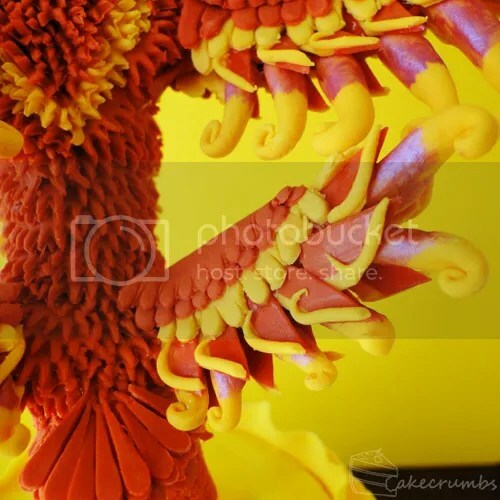 I had absolute hell trying to make the curled yellow/purple feathers stay upright on the tail, but we got there in the end! 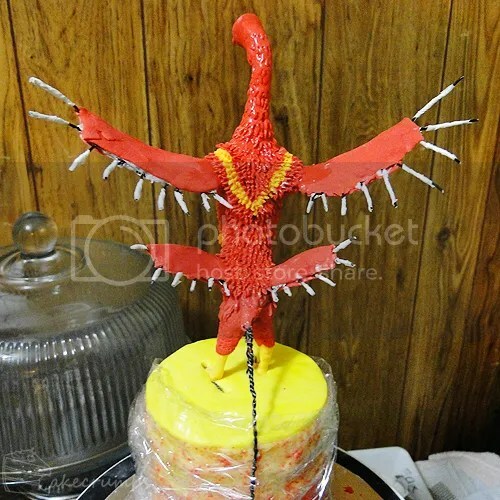 I made the length of the tail run down the cake – some is attached to the wire, other parts to the cake itself. And lastly it the tip of the tail, the part that Link latches onto and is so vital in the defeat of this enemy. I didn't do justice to it at all, but I hope it at least resembles the tip. Phew! As stressful as that all was, I'm glad I didn't throw in the towel and kept going. In the end I got something that, while quite far from perfect, challenged me in all sorts of manners. It's from mistakes that we learn best, and this cake was an excellent teacher. You created an unbelievable amount of detail in the furnix. Would have been so frustrating with all the troubles along the way, but hopefully made it more worthwhile and rewarding for you in the end. Can’t imagine the hours of patience you had to do this. I wasn’t sure if I wanted to stab the cake, or stab myself with it. 😛 Can’t believe I got it finished in the end. This looks amazing and I admire your persistence. Loved your writing style, and of course your work is mind-shattering. I love your subject matter too! It’s awesome that you’re bringing out and highlighting just how detailed Skyward Sword really was, even down to the creatures that you see in a few dungeons. My favourite thing about making fan art is that it makes you pay very close attention to the design. There is such endless work that goes into the most minute aspects that is hard to appreciate until you start to analyse it. Trying to replicate it makes me appreciate it all the more. Amazing. After all you did, I can understand the tail not looking as good as you’d want it to. Amazing!!! 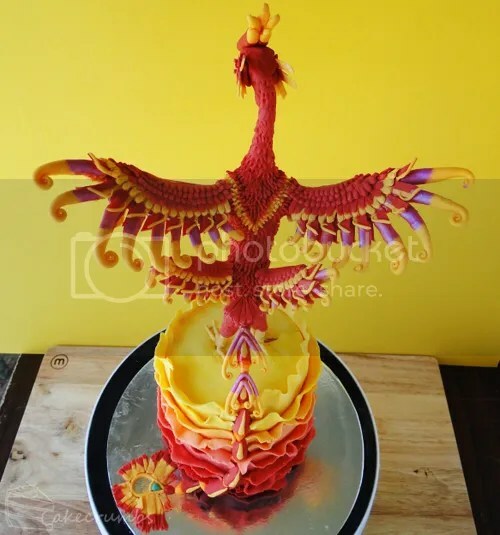 so beautiful and worth the effort , as a cake decorator myself I can appreciate the effort it takes to do detailed work . 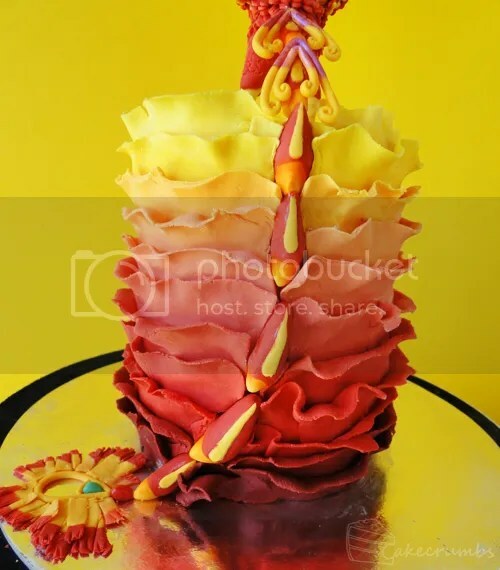 just one question what fondant did you use? This is absoloutley out of this world fantastic. I’m in love with your zelda cakes. This one and the deku scrub are my favorites. Its fantastic the ammount of detail you put into these. Its unreal. I myself aspire to make cakes like these, however i’m only just starting to veture into the world of cake baking. This is a huge inspiration for me. Absoloutley jaw dropping.